ITALY 14K Solid Gold 22" Figaro Necklace. Metal: Yellow GoldStyle: ChainLength: 20 - 21.99"
Clasp/Bail Lobster Claw Clasp. Average Weight 40 grams. Length 20". This delicate 14k yellow gold flat herringbone chain necklace is both feminine and classic. It is about 3.4mm wide (about 1/8"), 20" long and marked Italy and 14k on the clasp. Feeling the necklace very carefully, I can feel one slight bend but this is not visible. SUPER LOW PRICE 14K GOLD WOW! tri tone ( Yellow,Rose And White 14K Solid Gold). 18" lenght. Real 1/10th 10K Yellow Gold bonded hollow rope chain is presented with a professional bright polish for extra shine. This chain is 3.30mm wide and 20" length. This chain is ideal for wearing with a pendant. Beautiful solid 14k Italy twist necklace featured yellow, white and rose gold. Sensational in a MILANO chain. Also, available in WHITE GOLD. This necklace has a 14k yellow gold 4mm and 2mm balls and 8mm lobster claw. Total item weight is a 2.0 grams and it has a mark 14K. Up for your consideration is this 14k yellow gold chain necklace. All jewelry is cleaned and polished and will arrive in a fabric organza gift bag or jewelry box. We do our best to be prompt with our communication. Ending Apr 28 at 12:39PM PDT6d 12hMetal: Yellow GoldStyle: ChainLength: 20 - 21.99"
See photo for details. Great shape. The necklace and earrings are marked. 925. As always,I appreciate your interest and wish you GOOD LUCK! All 100% Genuine real PURE 10K GOLD. it has been tested and hallmarked 10k for authenticity. 10K gold lasts forever. Bail size: the bail fits up to 6x5 mm wide chain. very simple. Excellent quality and design. Simple in sterling silver, this round box chain features a slightly oxidized finish for a dramatic finishing touch. Sukhothai textured lobster claw clasp. Sterling silver. This high quality rope chain will not tarnish or discolor as it is Pure 10K Gold and MADE IN ITALY. This chain isNOT PLATED, NOT FILLED. 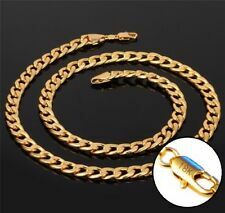 The Chain fastens with a 10K Yellow Gold Lobster Clasp that is very strong and easy to use. MADE IN ITALY. 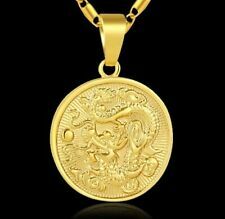 14k GOLD C LINK CHAIN 20. STAMPED 14k-DIV-ITALY. WEIGHT 3.14gr. NEW FROM INVENTORY. WE HAVE CATEGORIZED FOR EASY VIEWING. Weight: 2 oz. J634 Estate 14K Solid Yellow Gold 3.7mm Rope Chain Necklace, 20"
Beautiful pre-owned 14K solid yellow gold rope chain necklace with lobster clasp. Weighs 6.85 grams. Stamped 14K ma. 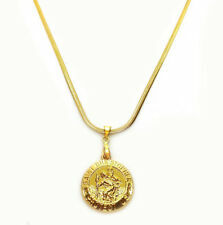 Style: ChainLength: 20 - 21.99"
18k Yellow Gold Men's Womens Rolo Link Chain Necklace With St. Christopher Pend. Condition is Pre-owned and shows minimal wear. Marked 14k gold. Very shiny beautiful chain. Fantastic italy estate necklace, crafted of 14k rose gold having a twisted link 2mm wide design, completed with a lobster claw clasp. PURITY 14K. TYPE Italy Necklace. grossly misrepresented. Carat weights and gold values stated are approximate, this includes stones etc in the weight. Marks : 14K, "A" in a circle. Weight : 2.46 grams. This gorgeous necklace features a 1/2” long 14k Bear Pendant on a 14k Gold 20” Chain. The pendant shows only minor scratches/scuffs from light use. Both are stamped 14K and total weight is 2.9 grams or. 10 ounces. This Sterling silver Milor chain features a shiny mirror-like design. This chain is marked 925 Milor Italy. 10K Yellow Gold Diamond Cut Womens Dainty 1.5mm Rope Chain Pendant Necklace 20"
This high quality rope chain will not tarnish or discolor as it is Pure 10k Gold and MADE IN ITALY. This chain isNOT PLATED, NOT FILLED. 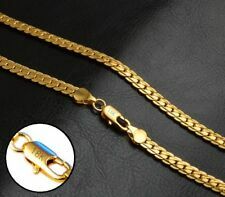 The Chain fastens with a 10k Yellow Gold Spring Ring Clasp that is very strong and easy to use. Note: the necklace is marked “Italy” and “925” on the twist clasp on two separate locations (see photographs). The necklace is 21” long, 4 mm wide, and weighs 37 grams. The necklace is in very good condition. Lobster Claw Closure . Beautiful Light Weight Rope Chain . Stamped '14K' for 14K Yellow Gold . 14K Yellow Gold. Necklace Weight: 3.7 grams . In GREAT Condition! AUTHENTIC ELEGANT 14K SOLID ROSE GOLD ROUND WHEAT CHAIN. GREAT FOR GIFTS TOO! AUTHENTICATED WITH A 14K STAMP. PICTURE ENLARGED TO SHOW DETAIL. - Clasp: 14K Rose Gold. 1 mm (approx). New ListingItalian 925 Sterling Silver & 14k Vermeil, Diamond Cut Rope Chain Necklace 20.5"
This beautiful single strand chain necklace is marked 925 and Italy in two separate places. This chain weighs 17.5 grams. All of my Pre-owned jewelry has either been polished by hand or cleaned in an ultrasonic cleaner. 14kt Yellow Gold Herringbone Chain Necklace. 20" Long 2mm, 3.27g. 18 K Yellow Gold Rope Necklace/ Chain. Lock: Security Clasp. Weight: 4.85 Grams. We are a second generation of jewelers. Beautiful STERLING SILVER 20” 3mm BEADED NECKLACE & 7” 3mm BEADED BRACELET. WEIGHING a total of 18. A wonderful addition to any jewelry collection. The set weighs 7.6 grams and is manufactured out of 14kt yellow gold. We want to resolve ANY problems you have. 14k solid Yellow gold hollow rope. link chain necklace with cross pendant. Gold : 14k. Weight : chain 3.10grams . 1.00 cross = 4.10 grams. All gold are 100% genuine. Not plated. MAKER'S MARK: SIGNED WITH THE VERONESE "V" MAKER'S MARK AND "925 ITALY", SHOWN IN PHOTO. 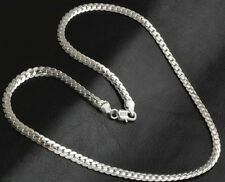 SIZE: 20" LONG BY 1.5mm WIDE (EXCLUDING THE CLASP AREA) WITH A WEIGHT OF 4.3 GRAMS.